Digital technologies are a concoction of advanced tools which are being used in shaping one’s brand. Academia is not untouched with these technological changes, an institute which doesn’t adopt current digital disruptions will be left behind. Considering social media as a universal wall to write whenever anything important happens, that needs to be shared and channelized in a systematic way. Most of the top institutes have adopted the simplest way to brand themselves through posting about where they stand in the competition. It not only creates #brand equity but also brings #credibility to the academic standard of an Institute. IIM Ahmedabad, the world-renowned institution also capitalizes the power of social media by sharing the success on its #twitter wall. The objective of #hashtags for ranking is to leverage the power of social media to build a brand and shares the success milestone. It gives a proud factor for alumni of IIMA and brings credibility in front of applicants and students. It has started sharing its global ranking on Twitter with #IIMA along with link description below in each post on twitter. IIMA is very active on Twitter, posts frequently on the wall. With this large network of 1,58,105 followers where tweets have reached over 2200, tap on its strategy to share and reach globally is in the right direction. 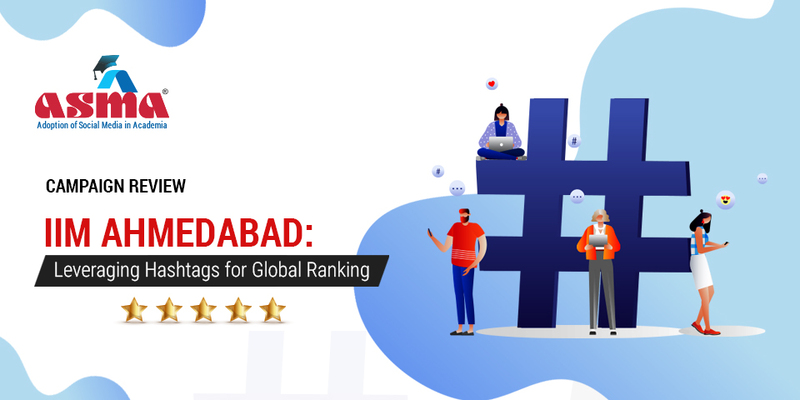 IIM Ahmedabad has shared with its followers on Twitter about Global University Employability Ranking, QS Global Ranking, FT Ranking on World Best #Business Schools for Master in Management Programs, and publishing this on twitter wall will make its existing students extremely proud to be a part of such esteemed and integrated institute. IIMA uses the ranking strategy to reach out large but specific audience having the area of interest in management. Create and use the #hashtag in tweet and retweet. Such #hashtags can be used for cross-promotion of post on other social media platforms. Some of the interesting facts about the hashtag #iim, #mba and #business in a week. Amount of money that the hashtag worth in market is $15,469. It is important to visualize something then just a simple & plain text. According to research, 78% of an average attention period goes to visual content (picture or snapshot). So, each twitter related post should have an appealing picture related to the area of a post. It is important to know what the topmost brands are doing in the market and how a simple step from them makes a huge change. The institute should follow the topmost brands, try to find out digital trends and adopt those in their strategies.